Wish is an ultra massive multiplayer online role-playing game taking place in a single shared and seamless online world. The game world is enormous - an area of over 246 square kilometres is currently represented as Wish goes into it's second beta and this area will continue to expand. 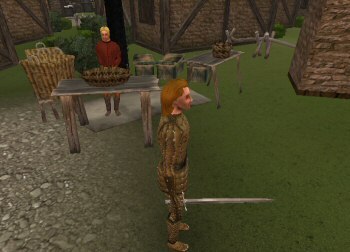 PathEngine powers NPC and player movement over this world in a solution based on automatic generation of a tiled set of PathEngine ground meshes. This enables the game to support arbitrary ground surfaces, seamless transitions into buildings and between dungeons and provides paths free of aliasing. The size of the world is effectively only limited by the rate at which meaningful content can be generated. 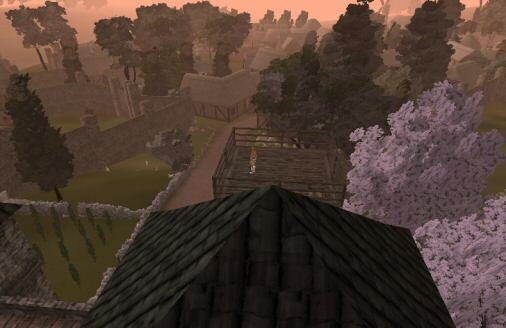 A mesh including the town of Thainesford is included with the SDK. Memory and query time benchmarks for this mesh are on the benchmarks page. Standing on the gate to Thainesford. Ground surfaces are defined by the creation of nav meshes on a per building basis. 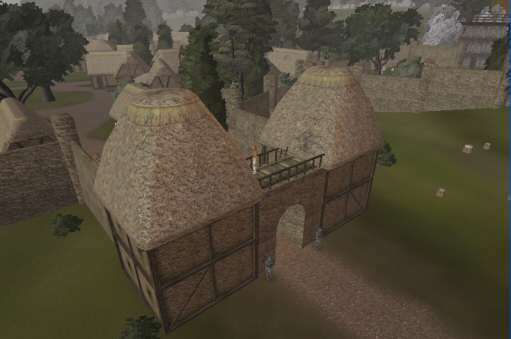 Buildings can then be placed on the terrain or connected together. The integration of these nav meshes into a seamless ground surface and generation of preprocess for fast run-time queries is then completely automated. Detail objects are placed in 3D and then automatically integrated into the preprocess as obstacles for pathfinding. PathEngine's Minkowski Expansion code takes care of reducing complex configurations of overlapping obstacles into a single expanded obstruction boundary. Some detail objects shown in the PathEngine testbed. The same location shown in game. Quote: "The pathfinding in this game is nothing short of astounding, and yet another aspect that is completely new to the MMORPG industry." Quote: "The path finding is hands down one of the best I have ever seen. You simply click where you want to go and your character will go around trees, rocks, forts, hills and just about everything I could test it on."